Take ride on the worlds largest land creature. 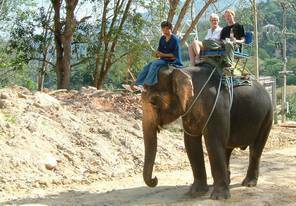 Through rubber plantations and rainforest - with breath-taking views to the Andaman Sea. 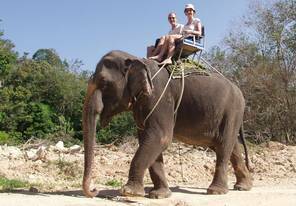 For the most visitors arriving into Thailand, a ride on the back of this mammal will be an unforgettable experience. Since 1989 when logging in the national forests was abandoned, the days of the working elephants were to be limited. Even though the elephant still is one of the most respected animals among the locals. For the Mahut (elephant caretaker), daily life is not always easy. The creature can consume up to 300 kg of food a day to keep it from being hungry. 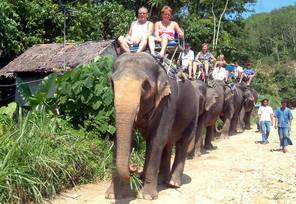 By paying for an elephant ride though beautiful landscapes, you will at the same time secure the existence of the elephant. 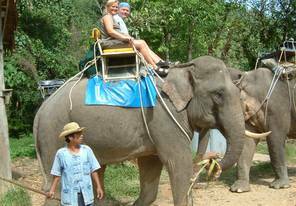 When you arrive to the elephant camp the Mahut will demonstrate how you get close friends with your giant new friend. Hereafter we venture up in the hilly jungle terrain and enjoy the view over Relax Beach, Karon’s white beaches and the crystal blue Andaman sea. The green forest has a variety of sounds from exotic insects.